In Short Lines & Branch Lines Volume 3, we'll revisit the industrial lines in the Lehigh River Valley and then work our way west to the coal regions in the Wyoming Valley. 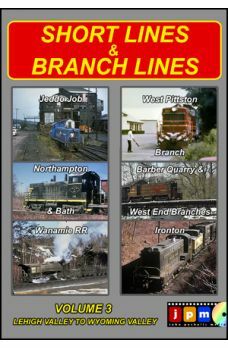 We'll view the Northampton & Bath and Ironton in the early 70's, the LNE Bethlehem branch, the Lehigh Valley's Barber Quarry and West End branches, the lines to Jeddo and the West Pittston Branch in early Conrail and close with the Wanamie Mine Railroad in Newport Township near Nanticoke. Narrated with commentary by Mike Bednar. Color and synchronized sound.